This straightforward, results-driven kit incorporates four skyn ICELAND® products designed to give stressed out skin a fresh start. After 5 days, skin is calmed, healthy and glowing. This kit contains a one month supply. Stop all other skincare products and use the Detox Kit for five days to rebalance skin. After the first five days, continue with regimen or begin to reintroduce other products. Glacial Face Wash: Water/Aqua/Eau*, Glycerin, Myristic Acid, Potassium Hydroxide, Hydroxypropyl Starch Phosphate, Behenic Acid, Lauric Acid, Palmitic Acid, Sodium Methyl Cocoyl Taurate, Stearic Acid, Ricinus Communis (Castor) Seed Oil, Salix Alba (Willow) Bark Extract, Avena Sativa (Oat) Kernel Extract, Rubus Chamaemorus (Arctic Cloudberry) Seed Oil, Oxycoccus Palustris (Arctic Cranberry) Seed Oil, Luffa Cylindrica Seed Oil, Thymus Vulgaris (Thyme) Flower/Leaf Extract, Buddleja Davidii Extract, Angelica Archangelica Root Water*, Butyrospermum Parkii (Shea) Butter, Laminaria Digitata Powder, Simmondsia Chinensis (Jojoba) Seed Oil, Sodium Lauroyl Oat Amino Acids, Propylene Glycol, Xanthan Gum, Menthone Glycerin Acetal, Disodium EDTA, Ascorbyl Palmitate, Ethylhexyl Palmitate, Tocopherol, Retinol, Polysorbate 20, Lecithin, Peg-75 Shea Butter Glycerides, Pentylene Glycol, Perfluorodecalin, Glycosphingolipids, Ethylhexyl Methoxycinnamate, Butyl Methoxydibenzoylmethane, Ethylhexyl Salicylate, Butylene Glycol, Potassium Phosphate, Alcohol, Phenoxyethanol, Benzoic Acid, Dehydroacetic Acid, Ethylhexylglycerin, Polyaminopropyl Biguanide, Potassium Sorbate, 1,2 Hexanediol, Caprylyl Glycol, Sodium Benzoate, BHT, Butylphenyl Methylpropional, Linalool, Hydroxyisohexyl 3-Cyclohexene Carboxaldehyde, Benzyl Salicylate, Hexyl Cinnamal, Geraniol, Limonene, Citronellol, Eugenol, Parfum (Fragrance), Blue 1 (CI 42090), Red 33 (CI 17200) * component of Icelandic Glacial Water. Icelandic Relief Eye Pen: Water/Aqua/Eau*, Isocetyl Stearate, Glyceryl Stearate SE, Caprylic/Capric Triglyceride, Glycerin, Stearic Acid, Decyl Oleate, Dimethicone, Phytonadione, Angelica Archangelica Root Water,* Polygonum Fagopyrum Seed Extract, Buddleja Davidii Extract, Thymus Vulgaris (Thyme) Flower/Leaf Extract, Rubus Chamaemorus (Arctic Cloudberry) Seed Oil, Oxycoccus Palustris (Arctic Cranberry) Seed Oil, Simmondsia Chinensis (Jojoba) Seed Oil, Hydrogenated Vegetable Oil, Hydrolyzed Wheat Protein, Aloe Barbadensis Leaf Juice, Gossypium Herbaceum (Cotton) Powder, Laminaria Digitata Powder, Hydrolyzed Rice Bran Protein, Butylene Glycol, Acrylates/C10-30 Alkyl Acrylate Crosspolymer, Pentylene Glycol, Cetyl Alcohol, Menthyl Lactate, Silica, Peg-6 Isostearate, Hesperetin Laurate, Perfluorodecalin, Glycosphingolipids, Xanthan Gum, Peg-75 Shea Butter Glycerides, Sodium Hydroxide, Disodium EDTA, Phenoxyethanol, Caprylyl Glycol, Sodium Benzoate, Potassium Sorbate, Ethylhexylglycerin, Benzoic Acid, Dehydroacetic Acid, Polyaminopropyl Biguanide *component of Icelandic Glacial Water. the ANTIDOTE Cooling Daily Lotion: Water/Aqua/Eau*, Glycerin, Butylene Glycol, Sodium Polyacrylate, Aluminum Starch Octenylsuccinate, Menthone Glycerin Acetal, Larrea Divaricata Extract, Saccharomyces Lysate Extract, Rubus Chamaemorus (Arctic Cloudberry) Seed Oil, Oxycoccus Palustris (Arctic Cranberry) Seed Oil, Spiraea Ulmaria Extract, Salix Alba (Willow) Bark Extract, Buddleja Davidii Extract, Thymus Vulgaris (Thyme) Flower/Leaf Extract, Angelica Archangelica Root Water*, Simmondsia Chinensis (Jojoba) Seed Oil, Aloe Barbadensis Leaf Juice, Laminaria Digitata Powder, Retinol, Ascorbyl Palmitate, Tocopherol, Panthenol, PEG-75 Shea Butter Glycerides, Polysorbate 20, Lecithin, Pentylene Glycol, Xanthan Gum, Perfluorodecalin, Glycosphingolipids, Myristyl Lactate, Myristyl Alcohol, Ethylhexyl Stearate, Trideceth-6, Ascorbic Acid, Phenoxyethanol, Caprylyl Glycol, BHT, Citric Acid, Sodium Benzoate, Potassium Sorbate, Alcohol, Potassium Phosphate, Benzoic Acid, Dehydroacetic Acid, Ethylhexylglycerin, Polyaminopropyl Biguanide, Butylphenyl Methylpropional, Benzyl Benzoate, Linalool, Hydroxyisohexyl 3-Cyclohexene Carboxaldehyde, Parfum (Fragrance) (Parfum). Oxygen Infusion Night Cream: Water/Aqua/Eau*, Caprylic/Capric Triglyceride, Butylene Glycol, Glyceryl Stearate, Squalane, Diisopropyl Adipate, PEG-100 Stearate, Dimethicone, Hydrolyzed Rice Bran Protein, Perfluorodecalin, Saccharomyces Lysate Extract, Imperata Cylindrica Root Extract, Oxycoccus Palustris (Arctic Cranberry) Seed Oil, Rubus Chamaemorus (Arctic Cloudberry) Seed Oil, Simmondsia Chinensis (Jojoba) Seed Oil, Angelica Archangelica Root Water*, Salix Alba (Willow) Bark Extract, Thymus Vulgaris (Thyme) Flower/Leaf Extract, Buddleja Davidii Extract, Aloe Barbadensis Leaf Extract, Ascorbyl Palmitate, Retinol, Tocopherol, Panthenol, Benzyl Salicylate, Linalool, Citronellol, Glycerin, Geraniol, Hydroxycitronellal, Spiraea Ulmaria Extract, Stearyl Alcohol, Xanthan Gum, Isostearic Acid, Sodium Hydroxide, Pentylene Glycol, Butylphenyl Methylpropional, Disodium EDTA, Peg-8, Hydroxyisohexyl 3-Cyclohexene Carboxaldehyde, Potassium Sorbate, Sodium Benzoate, Limonene, Lecithin, Peg-75 Shea Butter Glycerides, Carbomer, Glycosphingolipids, Alcohol, Polysorbate 20, Potassium Phosphate, Phenoxyethanol, Bis-Diglyceryl Polyacyladipate-2, Caprylyl Glycol, Benzoic Acid, Dehydroacetic Acid, Ethylhexylglycerin, Polyaminopropyl Biguanide, Parfum (Fragrance) * component of Icelandic Glacial Water. 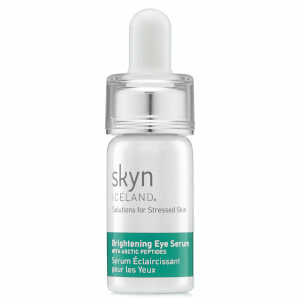 I love Skyn Iceland products. Ever since I tried their peel and glacial face wash, I have been hooked. Then, I gave it a shot to try this bundle because I was breaking out a little bit due to stress. I usually have very clear skin, so I wanted to get that on track right away. These products are all awesome so now this is my new regimen.